Voting is due August 28th. The ceremony and banquet for the 2009 Harvey Awards will be held on October 10th, at the Baltimore Comic-Con. If you click HERE, you can read an excerpt from our interview for The Comics Journal #298, which should be out for sale on Wednesday, June 24th. We did this interview over the course of many days, and each days could be weeks or months apart. Most of it was done before last year's SDCC, and some of it was done at the beginning of this year to talk about all our current projects (Daytripper, BPRD 1947 and Umbrella) and to also talk about all the Eisners we got last year, which took us completely by surprise (the "getting all those Eisners" part, not the "being interviewed about it" part). The reporter conducting the interview, Diego Assis, is a brazilian reporter, and I think this fact gave the questions an interesting "foreign" point of view. The interviewer is an outsider, and so are the artists being interviewed. Also, he had a much better view of our career both in the US and in Brazil, while an american reporter would only have an idea of what we have published in the US market. One interesting detail caught my attention: we did this interview in portuguese, and I'm guessing Diego did the translation. You can say we have a much stronger "accent" on his translation of the words. What caught Bá's attention was that they had Eduardo Risso's name misspelled - and we know he's from Argentina. We have a brazilian literary festival coming up in a few weeks, and two weeks after that, the San Diego Comic-con, so I think we'll have to really bury ourselves in the work for the following month in order to finish up everything we need to do. the hardcover edition on PIXU- the Mark of Evil should be out now or soon, and in July, BPRD 1947 starts coming out. Keep an eye out for this releases, and enjoy our interview at TCJ. Thanks for reading, and back to work. They say 33 is a special age. I feel pretty special today, and I hope my brother knows how special he is too. We feel like celebrating, and we will, but we also feel more like making awesome comics, which is what we've been doing most of the time instead of talking about our love for comics on the internet. I wish I had more time to scan and show sketches, talk about creation, fun stuff, but I rather make comics. They can tell you how awesome they are, and how fun, and how creative. I can't stand not sharing something, so here is the step-by-step of our Buffy- Tales of the Vampires cover, which came out this week and has an amazing story by our best buddies Becky Cloonan and Vasilis Lolos. 1-The initial sketch: we considered doing one single image, but we ended up deciding the split image was cooler, moodier and easier to divide the chores between the both of us. 2- Bá studies his part of the cover: Both of us could do this part of the cover, or even the other one. But we felt the other one was simpler and it would gain some personality with my brush inking, so Bá went after the characters in the love-triangle (it's all about love for us here). It looks awesome as it is, right? 3-Black and white ink is GOD: We love inking, period. We love black and white. 4-Colors. Ta-DAM! 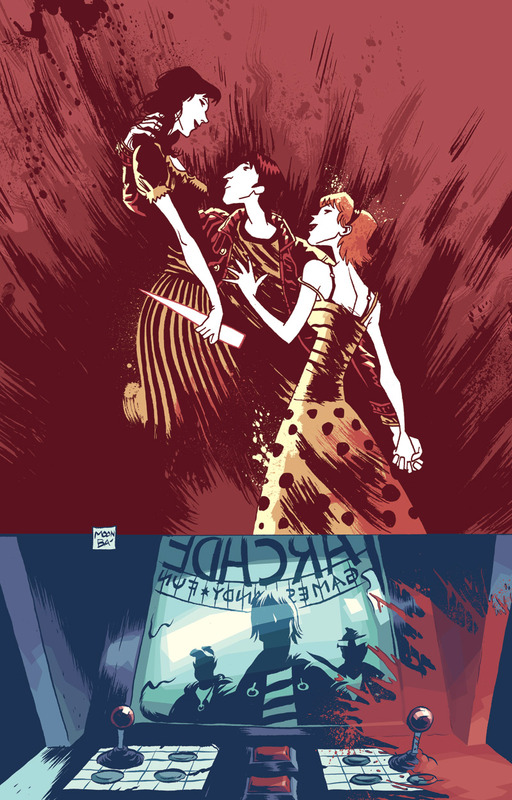 We have been watching our pal Dave Stewart do his magic on our books and we've been dying to get a chance to do some color work to see what can we do with colors in our post-Dave period. I have to say I'm pretty happy with the results. Well, that's it, back to work, see you some day, thanks for reading.